The step-mother of a former Speaker of the House of Representatives, Dimeji Bankole, Chief (Mrs) Adunni Bankole, is dead. Adunni, a known socialite and businesswoman, operated a household care products store, Sublime Group, at Opebi, Ikeja, Lagos, before relocating to Ogba Retail Market. She reportedly died of a heart-related illness five days after she fell into a coma. She died exactly 85 days to her 56th birthday (March 29). It was gathered that she had been ill for over a month, and was under medical attention. Adunni, who was the Iyalode of Gbagura, was said to have been expected to give her second daughter, Mopelola, out in marriage on the day she died. A source told our correspondent that the woman only witnessed the introduction ceremony. The wedding ceremony, however, held. The source said that the news of her demise was not made known to the two families and guests who had gathered to witness the ceremony. 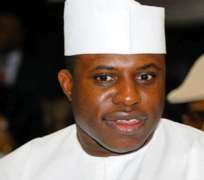 Efforts to make the husband of the deceased, Chief Alani Bankole, and former Speaker, Dimeji, comment on her death proved abortive. Alani Bankole merely said: 'I don't want to make any comment' when contacted on telephone.